For potato salad, we like to use Yukon gold potatoes because they are less starchy than Russet potatoes. They hold up better after cooking. You can also use red potatoes, they are waxy and hold up well. You can find Yukon gold potatoes at almost every grocery store. Since I have always hidden from the big bowls of potato salad at potlucks, I really wasn’t sure where to start. Luckily, Josh loves it and had some ideas up his sleeve for our potato salad recipe. We started with simple potatoes and added in all of the fixin’s to create one amazing potato salad recipe! Here is how to make the perfect potato salad! Start the potatoes in a pot of cold water where they’re fully submerged. Then bring the water to a boil and reduce the potatoes to a simmer to finish cooking. This will help the potatoes cook evenly. Make sure you add salt to the water when the potatoes are cooking to make sure the potatoes are nicely seasoned. This is where they will get flavor. Cook the potatoes until they are just tender when pierced with a fork. You don’t want the potatoes to be crunchy and you don’t want them to fall apart. For the dressing, we used Greek yogurt, light mayonnaise, yellow mustard, and whole grain mustard. We also added celery, pickles, green onion, and hard-boiled eggs. I was skeptical about the hard boiled eggs but Josh insisted on them. He said they are a must for a good potato salad recipe and he was right! I loved the eggs with the potatoes. To add a little something, something to our potato salad recipe, I added dill and paprika! They were the perfect finishing touches on our salad. Make sure the potatoes are cool before adding the dressing. If you add the dressing when the potatoes are hot, the dressing will get oily and can separate. I really enjoyed this potato salad! 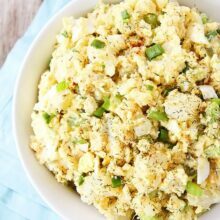 In my opinion, it is the BEST potato salad recipe out there! 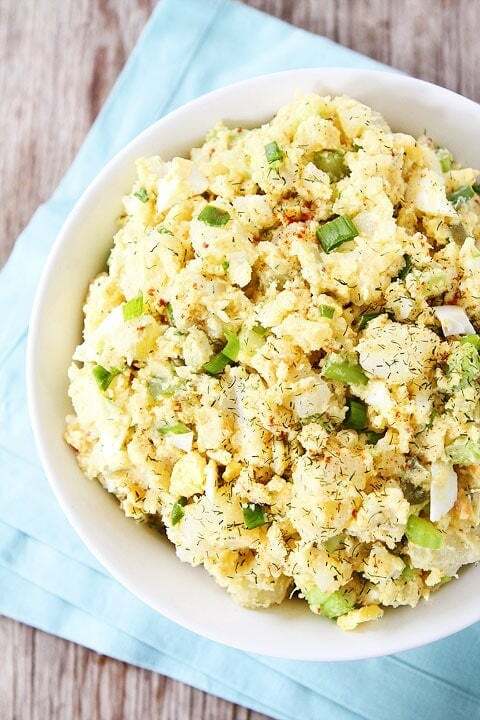 This Potato Salad Recipe is perfect for all of your summer gatherings! Make a big bowl for your next BBQ or party. I am sure it will go fast. I know if I was at your party, I would have a big helping, maybe even two! 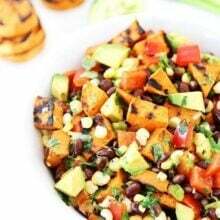 And if you are looking for a non-traditional potato salad recipe, try our Southwestern Grilled Sweet Potato Salad. 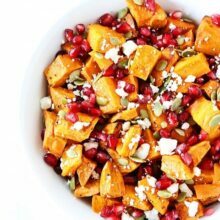 It’s a great salad for summer too! If you like this creamy potato salad, you might also like these other summer side dishes. 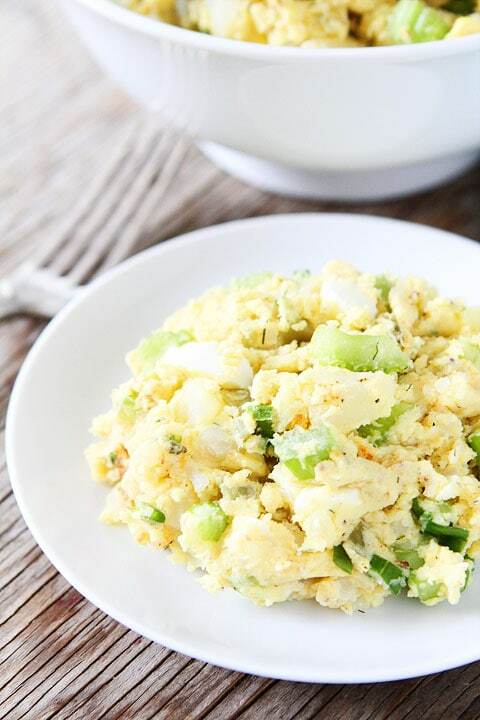 This is the BEST potato salad recipe! It is great for parties, potlucks, picnics, and BBQ's! In a large pot, cover potatoes with cold water. Add 1 teaspoon of salt to the water. Bring to a boil, reduce heat to a simmer. Simmer until the potatoes are tender when pierced with a fork, about 15-20 minutes. Drain potatoes and rinse with cold water. Once the potatoes are cool, cut them into chunks, about 1/2-inch pieces. Place potatoes in a large bowl. In another large bowl, whisk together the Greek yogurt, mayonnaise, and mustards. Pour the mixture over the potatoes and gently stir with a rubber spatula until the potatoes are well coated. Add the onions, celery, pickles, eggs, dill and paprika. Gently stir again. Season with salt and black pepper, to taste. Serve immediately or chill in the refrigerator for up to 2 days. Note-you can double or triple this recipe if you need a BIG bowl of potato salad! Sounds delicious! Since I’ve moved to Germany I’ve been surrounded by potato salad, but I have never done it myself (well… maybe because there is already so much of it around!). I must definitely give it a try. I loooooove potato salad. (I don’t eat it so often, but loving it a lot). I love potato salad especially with eggs, but because of the mayo I only eat it maybe two or three times a summer, using greek yogurt may have just increased my opportunities for enjoying it more often. Great recipe. I think adding the Greek yogurt with the mayo makes this potato salad awesome 🙂 and the hard boiled eggs and dill! 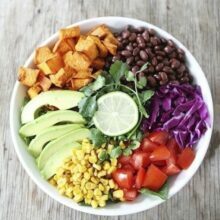 It’s funny how pregnancy changes our taste buds, this looks great guys! I like how you used some greek yogurt here. I’m luke-warm on potato salad, but sometimes you just need a good recipe for it. (P.S. autocorrect changed luke-warm to puke-warm….nice.) Have a great Wednesday! Nothing like good potato salad!! Love! Funny, I never liked potato salad until my second pregnancy, and that seems to have stuck around! Maria- is there a benefit to cooking the potatoes in halves and then cutting them up smaller as opposed to cutting them into smaller pieces before boiling? I didn’t want the potatoes to get too mushy and fall apart. You can cut them smaller before boiling if you wish! Although I love the way it is sort of all mashed together, I am curious why you chose russets instead of a waxy potato? Was that the intention? You can use your favorite potatoes! I use a recipe similar to yours but I think you forgot the most important ingredient – Bacon. A few pieces of bacon chopped up & mixed in really completes a good bowl of potato salad. I recommend adding some & you will see that that crunch of crisp bacon really does make it perfect. I was not a big potato salad fan either…until I used plain yogurt and cottage cheese instead of mayo. Blend the two together with a little apple cider vinegar, celery salt, celery seed, garlic powder and salt and pepper. My dad, a traditionalist, is not a fan but everyone else loves it. I am so ready for picnic season!! Love this tater recipe! Maria you are hilarious! Your enthusiasm for this potato salad put a huge smile on my face. Life’s small pleasures, right? Have a great day! looks great Maria! I agree with Aimee!! potato salad is awesome! A picnic recipe must try for me! Pinned! Yum! Definitely a must on any cookout menu! I love this recipes. Very similar to my own. Thank you. This is so great! The hubs and I were talking just last night about how he’s craving some potato salad. (He’s such a weirdo) like you the thought of it kind of creeps me out. I can’t wait to give this a try! He will be thrilled! 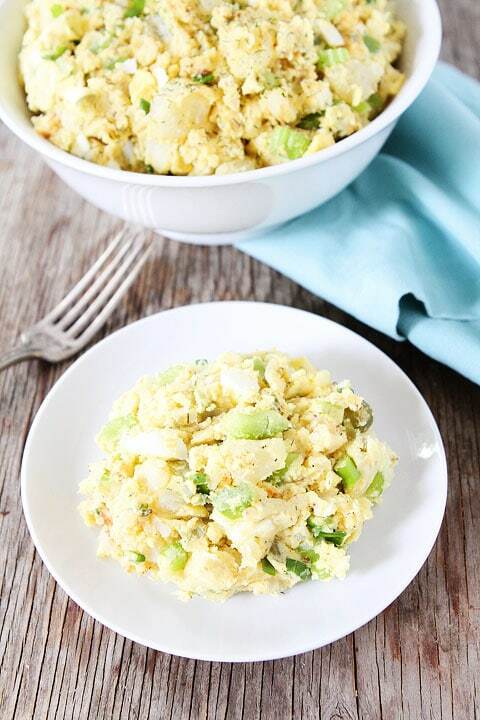 Loving this summer potato salad! 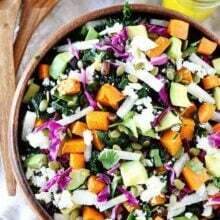 Just love your blog……a simple, delightful, down-to-earth couple with an adorable little boy and another one on the way….enjoy all that you share and find your recipes easy to prepare, nutritious and yummy! 🙂 I have adapted some of the recipes to what I have on hand, to being a part of my ant-cancer diet and recently when I saw your berry chia seed smoothie and knew since I didn’t have a blender fixed all the ingredients as a delicious salad and had a glass of almond milk with it ….very good and very tasty! Have a great and awesome day! I am so glad you are enjoying our blog! Thank you! Looks perfect for the summer holiday barbecues! In Bermuda we make potato salad another way. We put green peas or green peas with diced carrots and mayonnaise. The recipe seem good, I will have to try it. 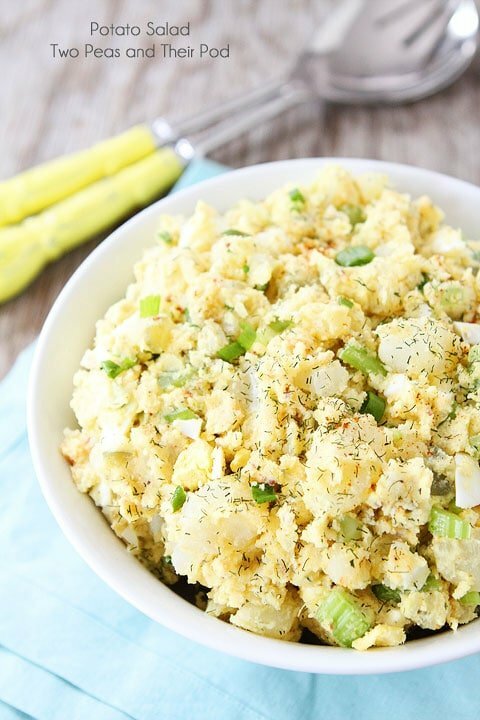 This looks so tasty – could definitely be the recipe to change my opinion on potato salad! This looks too fabulous — I LOVE potato salad. This is perfect! That is funny, I never really cared for potato salad until I got pregnant and then I craved it all the time. Sadly it has stayed with me (would prefer a less fattening craving!). I’m always lazy about it and simply buy it from the store, but I should give it a try sometime, looks pretty easy to throw together. You should try adding smoked edamame to the mix. Great flavor and texture. This is SO SO perfect for Memorial Day. On it!! Made this today, SO yummy 😀 I added some chopped red bell pepper hmmm. Thanks for another great recipe! Made this today for our early Memorial Day dinner and it is SO GOOD! I followed your recipe to the letter except for omitting the dill at the end (we kind of thought the pickles gave it the perfect amount of dill for our taste, but I’m sure it would be yummy with the added dill) and I can’t stop snitching bites of it from the bowl in the fridge… haha! The yogurt gives it almost a lighter flavor that is so refreshing! Thank you for yet another awesome recipe!!! I am not a big fan of potato salad either but I will give this one a try! Sorry, I’m confused. .you said you really don’t like potato salad and yet the recipe you invented is, while undoubtedly delicious… classic potato salad. We really like chopped black olives in our potato salad. Gives a little sweetness. We arent chunky potato salad eaters. I run my potatoes through a food mill. Great recipe with the different mustards. Maria, thank you for sharing this tasty recipe! I served it at my 4th of July barbecue yesterday, and everyone raved about it! For me, it’s the dill pickles along with the fresh dill that really make this salad pop. I needed this recipe yesterday…..darn 🙁 looks like my kinda potato salad!! Loving using part Greek yogurt for this to make it healthier!! Thanks! It is our favorite potato salad recipe. I adore potato salad and would eat it weekly except for the fat content and high csrbs. Have to watch the carbs being type 2 diabetic. This sounds yummy. My only hesitation is the dill pickles. I love those too, but I have terrible memories of biting into a big forkful of an unknown person’s version of potato salad and getting hit with the god-awful sweet pickle relish laced stuff! But since the recipe has gotten such race reviews, I will take the lunge. All my other recipes from Two Peas have turned out great.